1. Decorate with Something Other than Frames - Sick of seeing frames everywhere? 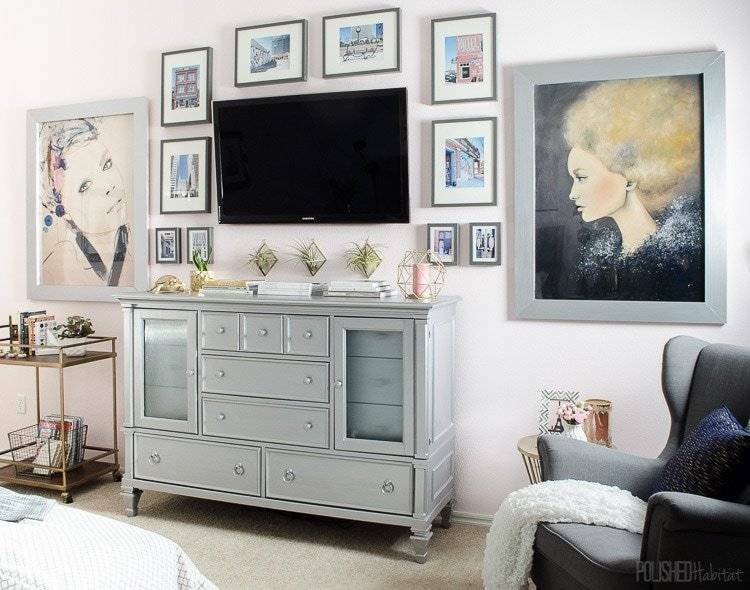 Adding something unique like baskets, hats or another type of decor can still decorate your wall and detract from the TV (like in the image above via Jessica McCarthy). 2. Add Themed Artwork - Pick a theme for framed artwork in uniform frames to hang around the TV, like Polished Habitat did with these city photos. Psst, ever wondered how to go about hiding television wires like the example above? Well, it's surprisingly easy (if you are willing to do some extra drilling). Hide television wires with an in-wall cover and power kit like this one. 3. Go High - Take advantage of high ceilings and add artwork all around your TV in a triangle shape, drawing your eyes upward. 4. Paint the Wall Black - Because TVs are (generally) black, why not disguise it against a black accent wall?! Add white framed artwork that pops, and the hidden TV practically disappears, like in this example from Rain on a Tin Roof. Here's another example of a black wall camouflaging a TV and accompanying stereo equipment (via Apartment Therapy). 5. 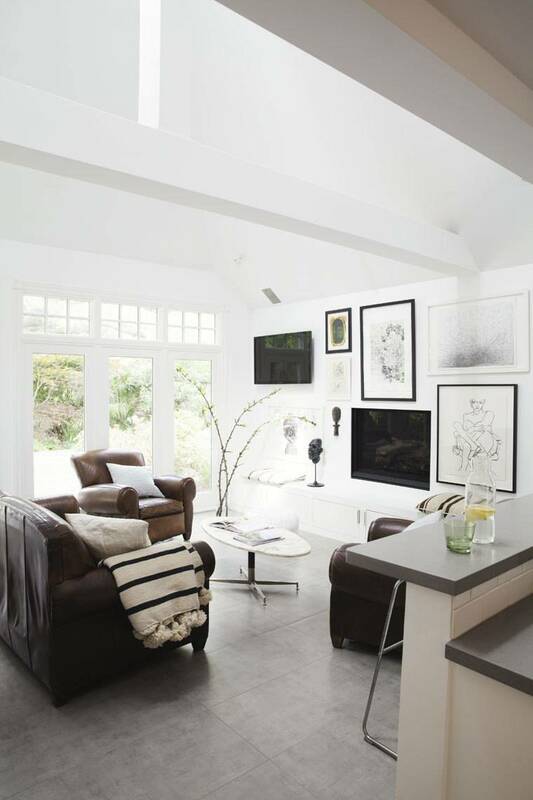 Add Large Art - The way this photographer used large scale artwork in black frames helps draw your attention away from the TV and actually makes the TV seem like part of the decor. 6. Incorporate Wall Mounted Storage - Add thin wall mounted cabinets above your TV! Not only do you gain storage in an unused space but it grabs your attention and give you another space to decorate. 7. Use Bold Frames - Add gold, intricate frames behind and around the TV. They'll add color AND texture to the space! Here's another gallery wall, this time with a mix of bold colors and styles to distract from the tube. 8. Add a Textured Wall - Turn the wall behind your TV into an accent wall (even just a section) with reclaimed wood, shiplap or beadboard to make the wall the real star of the room. 9. Hang It on a Bookshelf - If you have built-ins, faux built-ins or just an extra large bookshelf, fitting your TV in the middle is a great way to decorate around it. Plus, having shelving around your television makes it easier to hide wires. 10. Hide It Behind Art - Here, the TV has been hidden behind sliding artwork. Genius! You can read about how it was made here. Here's a less hands-on version of the hidden TV behind art - there's a TV behind that pull-down map! See it on Home Love Stories. 11. Go Monochromatic - Tucking it into a gallery wall filled with black and white art works well too, like this gall from A Storied Style. 13. Hide It Behind a Mirror - This mirrored cabinet from Pottery Barn is an easy yet super stylish solution for a hidden TV. 14. Disguise It With Smaller Panels - These decorative panels from Huisje Kijken Wonen & Lifestyle look quite beautiful in this neutral space. This TV is hidden behind some beautiful sliding faux barn doors. See this hidden media storage on Pottery Barn. 15. Go Camo with Dark Wallpaper - Similar to painting the wall black, this method of disguising a TV is a little less bold. Dark patterned wallpaper is a clever way to mask your TV, like this one spotted on Style At Home. 17. Hide the Wire, Highlight the Screen - The TV is still exposed with this idea, but unsightly cords are hidden away with expanding shelves! See it on OneKindesign. 18. Panel It - There's more to this wall paneling than meets the eye. This solution was spotted on Southern Living - a small compartment opens and reveals the hidden TV! 19. Shutter It - Hide the television behind some window shutters. See it over on Ballard Designs. 20. Get an "Art TV" - This might be the most expensive hidden TV option on this list, but it's also the most effective. Samsung's The Frame is a TV when it's on, and turns into art when it's off. Magical. Have you used any clever hidden TV ideas in your own living space? We'd love to see! Leave us a comment, or post a picture on Instagram and tag #curblylovewhereyoulive! Share these hidden TV ideas on Pinterest! Televisions are a reality for most people, but that doesn't change the fact that they're not the prettiest thing to look at. However, with a little design know-how and maybe some DIYing, there are plenty of ways to camouflage or dress up so they don't look like the center of your living space. Who's ready to redecorate?! Check out these 7 tips for arranging living room furniture.